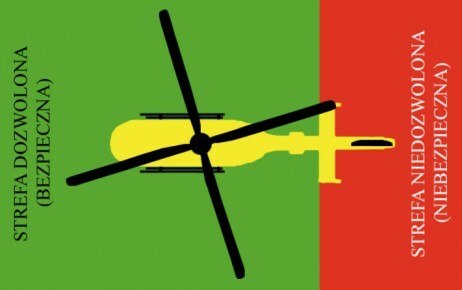 During the landing, engine shut down, starting and takeoff (in general: when the rotor is rotating) – it’s strictly forbidden to approach the helicopter, either on the designated HEMS helicopter landing or on the distance shorter than 30 meters. A gust of wind created by the rotors might move loose items (for example, linen from the stretchers, foil, snow, dust). This can be a threat to the people in the close surrounings and to the helicopter. Never pass in the vicinity of the helicopter tail propeller! Never approach the helicopter from a rising slope! Watch out for the main rotor blades! Approach the helicopter from the front or the side. Only approach the helicopter after a clear signal from its crew, after the helicopter has stopped. After the transfer of the patient, contact the crew only by radio or visually – don’t approach the helicopter!